A bicycle is an iconic symbol of childhood, and there’s nothing more exhilarating than watching a child take off on a bike for the first time. If you’re considering getting your child a bicycle, it’s important to set her up for success. A child who gets a bicycle before she’s ready to use it may be overwhelmed and even frightened by learning to ride, thus decreasing her desire to ever learn to ride. Conversely, when parents wait too long, children may lose interest in biking altogether and never learn how to do it. Here are some things to consider when deciding whether or not to get your child — or a child you love — a bike. 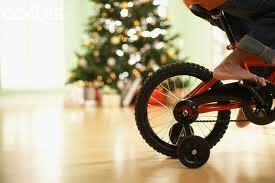 There’s no set age at which a child can or cannot get a bike, because each child matures at a slightly different rate. Generally speaking, however, children should be given bikes no earlier than three years old. Six or seven is generally too old to get a child her first bike, although many children can’t ride a bike without training wheels until this age. Although biking offers numerous health and social benefits to your child, it can also be dangerous for a child who refuses to listen. Your child should have sufficient verbal skills to follow basic directions, and should understand basics such as courtesy and listening. This makes it much more likely that your child will follow rules about bicycle helmets, where he can and cannot ride, how to minimize the risk of bicycling and with whom he can and cannot ride. Children develop at vastly different rates. Some two-year-old's have excellent balance, while some five-year-old's are just beginning to walk down stairs by themselves. Your child should be able to walk in a straight line, stand on one foot, and jump without falling down before you consider getting her a bike. She should also have the self-awareness to be able to recognize her own limitations. A child who, for example, thinks she can safely jump down the steps may not be ready for a bike for another few months. It’s generally a bad idea to get your child a bicycle if he hasn't previously ridden a big wheel, glider or other toy that requires pedalling Pedalling can be challenging for children who have no experience with it, so focus on helping your child practice with a glider or other pre-bike toy before taking the plunge and getting the two-wheeler. These toys help your child develop balance and self-confidence, and will very likely increase her interest in getting a bicycle of her own. Christobel Edwards became a grandmother two and a half years ago for the first time. She feels this is not only the next step in life but a time when you often have to learn to keep your mouth shut. She loves buying things for her grandchild and recently bought her a balance bicycle.